Watching Arnie stride across a cinema screen is surprisingly disconcerting. It’s been 10 years since his last leading role and something has changed, not necessarily for the best. ‘The Last Stand’ is Schwarzenegger’s ‘comeback’ movie, a chance for an audience to get reacquainted with him following his absence. He’s got a lot on his plate at the moment, with sequels to ‘Conan’, ‘Terminator’ and ‘Twins’ as well as three original films on the way, all within the next three years. 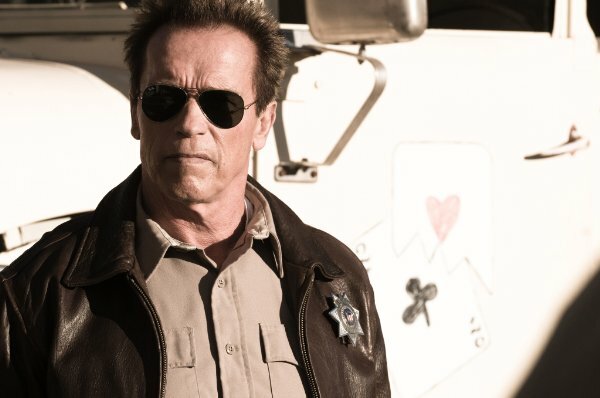 ‘The Last Stand’ functions as the opening salvo in Schwarzenegger's battle to reclaim his place at the pinnacle of the action movie genre. But it's going to be a long climb. Schwarzenegger plays Ray Owens, the Sheriff of Sommerton Junction. It's a sleepy Arizona border town where nothing ever happens. 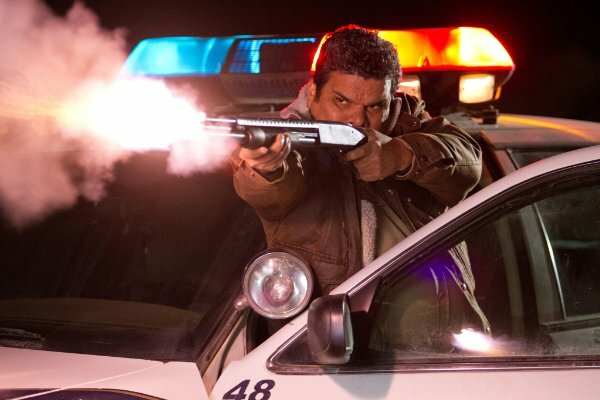 Well, that is until cartel kingpin Gabriel Cortez (Eduardo Noriega) escapes federal custody in Las Vegas and begins barrelling towards the border at 200mph in a modified sports car. Cortez has an army of gangsters on standby to clear the way and once he reaches the border he’s home free. The only thing standing in his way is Sheriff Owens and his plucky gang of misfits. Can they succeed where all else fails? 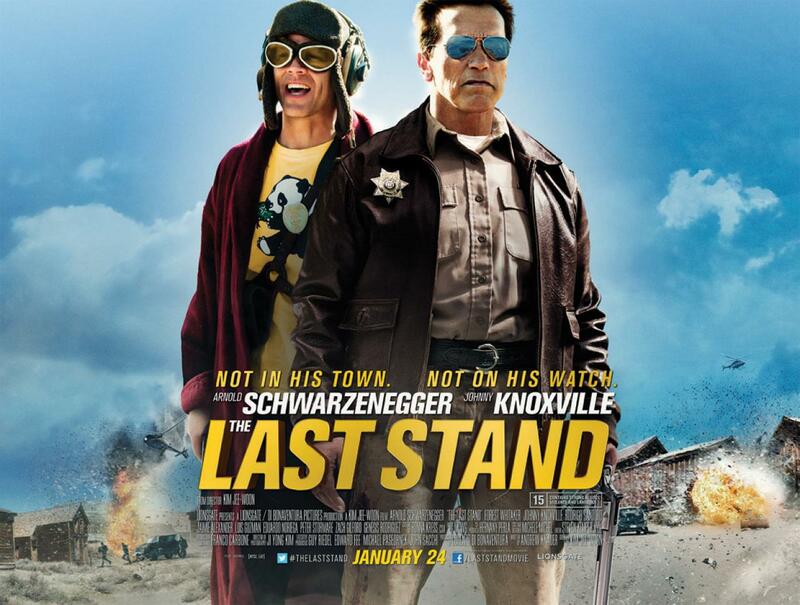 ‘The Last Stand', as you can probably guess, is not a particularly complicated film. It's a pretty straightforward setup, one which allows for big gunfights, a few car chases, some witty dialogue and several big explosions. Director Jee-woon Kim delivers all this competently, but there’s a strange perfunctory nature to proceedings. Elements of the film reek of a quick production turnaround, a need to get ‘something’ out there as quickly as possible while Schwarzenegger is available. Given the bland nature of the much of the dialogue, I'd guess that this was an off-the-shelf script produced primarily because it's easy to shoot, and aside from Schwarzenegger himself, relatively cheap. Unfortunatley, the main problem with this film is its most expensive element: Schwarzenegger. The man can’t act. I’m well aware that most people consider him never having been able to act, but in the right role he can work wonders. No-one plays an emotionless robot killer quite like Schwarzenegger and throughout the 80s and 90s he exuded the strange indefinable charisma that’s the mark of a ‘true’ star. A large part of this was his sheer physicality; he effortlessly dominates the frame in his iconic films, possessing an magnetic confidence that made up for any acting shortcomings. 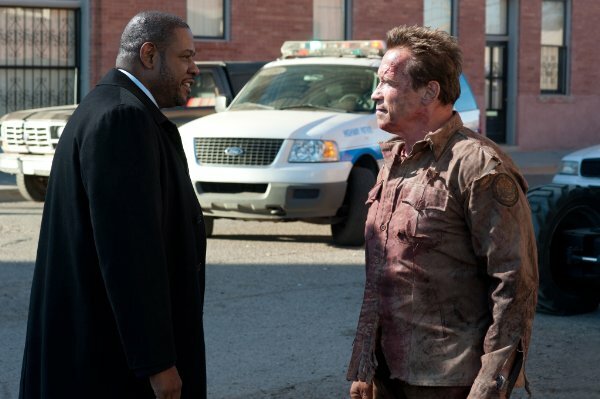 Forest Whitaker as Agent John Bannister with Arnie. Whitaker must be one tall dude. This charisma and magnetism seem to have ever so slightly drained away from him. The reality of political office and personal scandal have slightly taken the shine off the man. He could once rely on his simple presence to carry him through a scene, but now he's diminished and his shortcomings have become much more noticeable. You notice with faint surprise that delivering natural sounding dialogue is absolutely impossible for him. Everything is delivered in the same slow familiar monotone, frankly he sounds like a Schwarzenegger impersonator. There are rare moments where the Arnie we know and love surfaces for a moment but these glimpses only highlight what’s lacking elsewhere. Schwarzenegger looks every bit of his 65 years of age. The man who was memorably described by Clive James as looking like “a condom stuffed with walnuts” now looks more like a chewed up pencil eraser. His skin looks leathery, his hair unnaturally dyed brown and his gait lumbering. He looks like he’s having difficulty even moving naturally, not even being able to walk across a diner without looking awkward and clumsy. This gives him an unexpected vulnerability, but unfortunately the film doesn’t exploit this. A slightly more thoughtful film might examine the psychological impact of ageing on someone largely known for their physical fitness, but aside from a few one-liners this rich seam of drama is almost entirely overlooked. Arnie with Johnny Knoxville as Lewis Dinkum. Despite being on all the posters, Knoxville really isn't in the film much at all. Perhaps as a result of the physical restrictions on what Schwarzenegger can actually do, ‘The Last Stand’ has a serious gun fetish, one that feels slightly distasteful given the rash of recent shootings in the US. Johnny Knoxville plays ‘Lewis Dinkum’, an unhinged gun collector with some questionably legal firearms. The camera lingers lasciviously over these weapons, with suggestive shots of rounds sliding seductively into a sniper rifle, chattering tommy-guns and a character practically becoming orgasmic as they feed an ammo belt into an unavoidably phallic WW2 era machine gun). Many of these guns are practically characters in the film in their own right. One particularly outlandish hand cannon named Henrietta even has a rudimentary character arc! This anthropomorphising of machines extends to the principle villain, who for all intents and purposes might as well be a Transformers-style intelligent car. Following this train of thought has some weirdly metafictional implications for Schwarzenegger. If all around him machines are being treated as people, is the film saying that Schwarzenegger’s power here comes from his ‘machine’ quality? The film treats him as the one incorruptible man who will never, ever back down. The problem is that if we’re supposed to be equating Schwarzenegger with a machine, he’s in obvious need of some oiling and a few replacement parts. ‘The Last Stand’ does have certain charms: a familiar self-aware humour and a fine supporting cast including greats like Peter Stormare, Forest Whitaker, Luis Guzman and Harry Dean Stanton. None of these actors are stretched in the slightest by the feather-light script, but at the very least they provide a firm backbone to proceedings. The main problem is that there is nothing here you haven’t seen before in a hundred other films. It’s painfully generic, and the thrill of seeing Schwarzenegger back on the big screen is tarnished by his disappointing performance. Avoid.